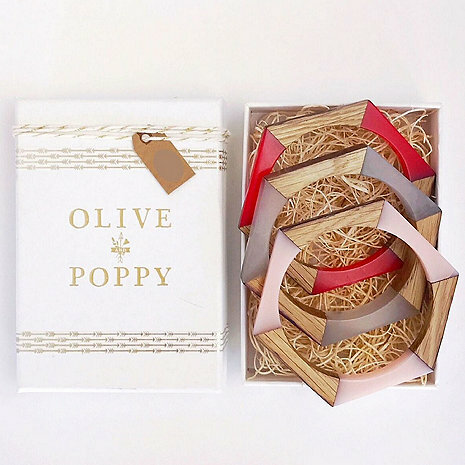 Our best selling stackable Barrels Bracelets are now perfectly packaged for the holidays! The trio includes a 1/4" ruby, 1/2" translucent and 1/4" rosé colored bracelet in a festive white and gold box. A perfect gift for the wine lover in your life! The Barrel Bracelets are made from alternating segments of reclaimed oak wine barrel wood and colorful lucite. These statement bracelets are a unique and one-of-a-kind way to bring a piece of wine country everywhere you go. Streaks of red wine stain are still visible in pieces of the wood. Arrives in gift-ready white and gold box and includes three bracelets.